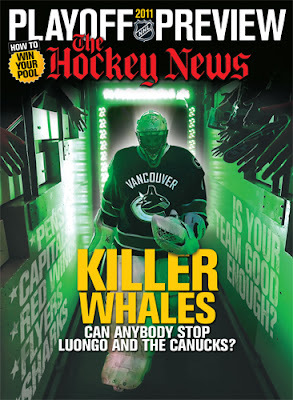 Ronn's Minor League Hockey Mania: What Killer Whales? It looks like the answer to this issue of the Hockey News' front cover question is... um... YES! It was great fun to see how quickly all the Canucks car flags disappeared after game 7. I have not been a Canucks fan for years (the Senators are my team), but I am always amazed at how lame the Canucks fans are. When Vancouver is doing well, every one jumps on board the fan wagon, but they are also just as quick to jump off when the team loses! Congratulations to the Boston Bruins. And thanks Boston for saving me from having to listen to the fan wagon horn from blaring for days after game 7. And don't worry about the little riot we had. As it was pointed out, us Canadians are very polite and we all showed up the next day to clean up after ourselves.